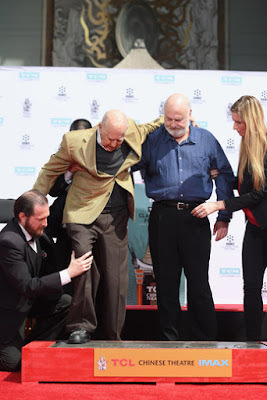 On the second morning of TCM Classic Film Festival 2017, I had the pleasure of attending the Carl Reiner and Rob Reiner hand and footprint ceremony in the forecourt of the Chinese Theatre. I was especially excited to cover this ceremony, because this is the first time a father and son have been simultaneously awarded this honor. For the first time we were seated for the ceremony, which was a bit disappointing, since we had a perfect spot for taking photos at the Francis Ford Coppola ceremony the year before, but it was also nice to have an assigned spot from which to watch the proceedings. It was especially interesting to hear Crystal reflect on his relationship with Rob Reiner. I'd never thought about how many interesting films they made together, though in widely varying levels of participation: This Is Spinal Tap (1984), The Princess Bride (1987) and perhaps the biggest hit of the comedian's career, When Harry Met Sally (1989). You got the impression that he looked upon the Reiners as family. Perhaps show business can be brutal, but there are plenty of deep, affectionate friendships to be found in this industry and this is one of them. The Reiners were as charming as I expected. Carl has often spoken about the importance of loving, supportive parenting, and you could see that he took his own advice in the way he interacted with his son. These profoundly funny men clearly adore each other. Carl told a touching story about Rob as a child. Apparently the junior Reiner told his father one day that he wanted to change his name. Assuming that his son wanted to distinguish himself from his father, he stoically accepted his child's decision. It turns out that he wanted to change his name to Carl. True mutual adoration. The pair approached the ceremony with humorous gusto, suggesting at one point that they put their bald heads into the cement. 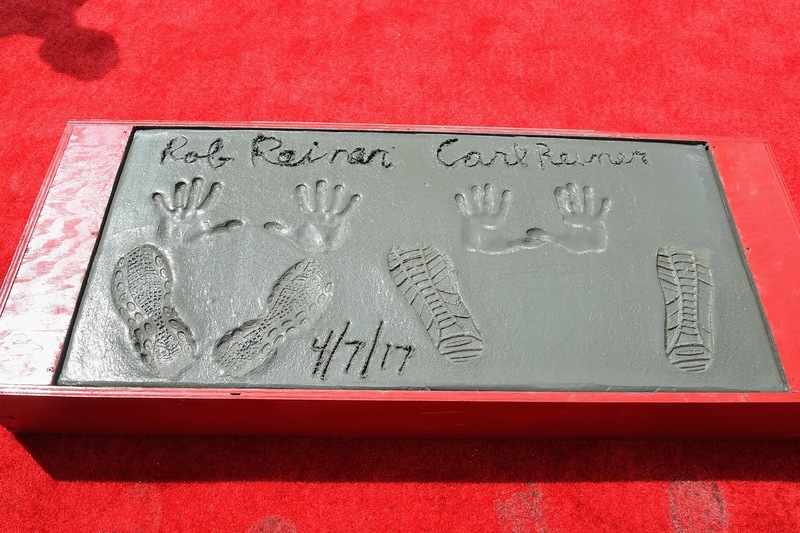 When Rob made a crack that he had a "wide stance" he looked over, delighted, when several people in the crowd got the reference and laughed. 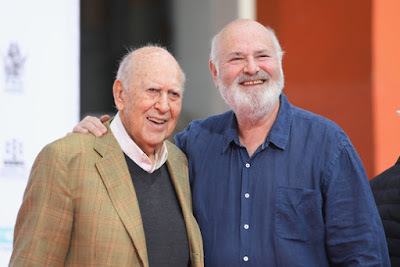 In a tweet that morning, Carl Reiner had joked that he was excited about the ceremony, but worried he wasn't going to be able to get up. Fortunately, there are people for that. We don't know their names, but there wouldn't be a ceremony without them! 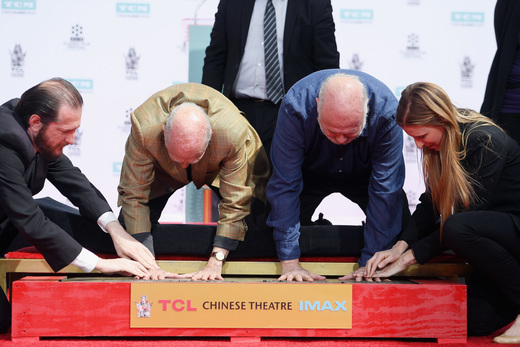 As always, the hand and footprint ceremony at The Chinese Theatre was a fascinating, one-of-a-kind event. It was a delight to see these two men honored together. They seemed delighted to be up there together themselves. 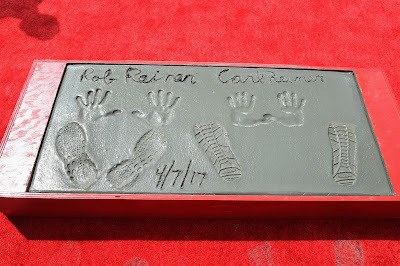 More TCMFF coverage to come! All photos property of A Classic Movie Blog except where noted.